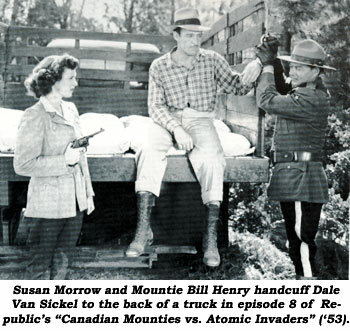 Stuntman/actor Dale Van Sickel was born November 29, 1907, in Georgia. After his high school graduation, Dale came to the University of Florida where he became a star football player. Arriving in Hollywood around 1933, he made his film debut in “Hollywood On Parade #9”, a popular short subject series of the time. Dale soon thereafter was working on “Duck Soup” (‘33) with the Marx Brothers. 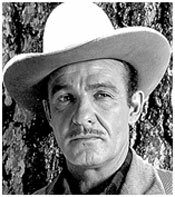 Dale’s forté, however, came in the hundreds of westerns he appeared in, mostly at Republic. Dale’s first stunt work at Republic was doubling Reed Hadley in “Zorro’s Fighting Legion” (‘39). For a while he banged around doing stunts in both Universal serials (“Don Winslow of the Navy”, “Gang Busters”, “Raiders of Ghost City”, “Master Key”) and Republic (“Captain America”, “Haunted Harbor”, “Manhunt of Mystery Island”), even Columbia (“Spider Returns”, “Black Arrow”) before finding a home at Republic by ‘45. 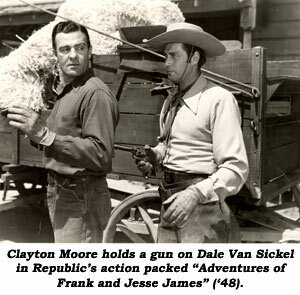 In Republic westerns he can be spotted doubling John McGuire in “Bells of San Angelo” (‘47), Roy Barcroft in “Renegades of Sonora” (‘48), Douglas Fowley in “Susanna Pass” (‘49), Grant Withers in “Trigger Jr.” (‘50), Stephen Chase in “El Paso Stampede” (‘53), even Steve Brodie in “Guns of Hate” (‘48) (at RKO) and dozens more. Also adept at car and truck work, Dale put those talents to good use in all the modern day serials he worked on at the thrill factory. Dale was easy to spot in action films of the ‘40s and ‘50s, estimating he worked on over 200 movies along with dozens of roles and stunts on television shows such as “Bonanza”, “Roy Rogers”, “Kit Carson”, “State Trooper”, “Stories of the Century”, “Yancy Derringer”, “Gunsmoke”, “The Untouchables”, etc. Dale Van Sickel had an almost 50 year career in Hollywood with some of his last work in such titles as “Requiem For a Gunfighter” (‘65) with Rod Cameron, “The Love Bug” (‘68) at Disney and as a stunt driver in the TV movie “Duel” (‘71) starring Dennis Weaver. Dale was one of the founding members of the group I now belong to, The Stuntmen’s Association of Motion Pictures. This group was formed by Dale along with Bill Hart, Loren Janes, Bob Hoy and other stuntmen, becoming the first such group in operation in Hollywood now since 1961. For all of us Saturday Matinee Buckaroos, we may have cheered the heroes and booed at Dale’s appearance on screen but we also knew we were in for some terrific fisticuffs when he showed up. After a long illness, Dale Van Sickel passed away January 25, 1977, in Newport Beach, CA, at 70, leaving a hell of an action legacy few stuntmen can match. And one we can still marvel at today. What a grand time Dale, Davey Sharpe, Tom Steele, etc. must have had tearing up those sets at Republic.